When we first moved to China oodles of years ago, it felt like all my cooking skills evaporated. Or rather, that everything I had learned to cook so far in my life was no longer applicable in the new culinary landscape. Serving spaghetti & meatballs with a salad went from being a quick, cheap dinner to an expensive, laborious meal. Whipping up a batch of homemade cookies went from something you did after dinner to a process that took months. So, I re-learned how to cook. Over the years, I figured out what I could make with the local ingredients I had access to. Part of that education was learning to make many foods from scratch that we would previously have purchased ready-made at the store. These were lumped with Icees and nacho cheese sauce in my mind: food-like products that magically appear at malls and school fairs everywhere, not foods one could actually make at home. What joy to know you can! (The nacho cheese sauce is another story.) These things are SO good straight from your own oven. Like soft pretzels, bagels get their unique outer coating from a dip in a stovetop jacuzzi before baking. 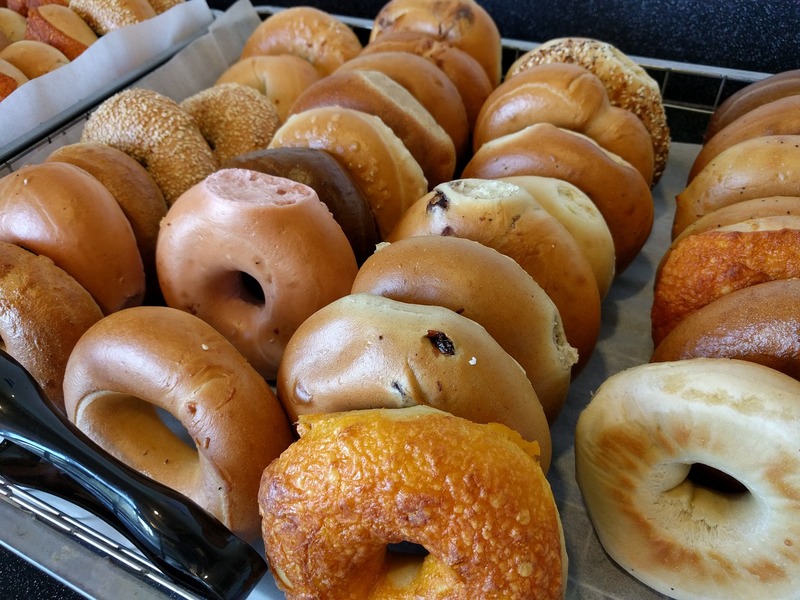 Making bagels requires a lot of effort and the process destroys a small kitchen, but yes, it’s worth it if you are craving some chewy goodness. We had better luck sticking with donut holes in a small Chinese kitchen rather than trying for full size donuts, but they are still an outstanding special treat. 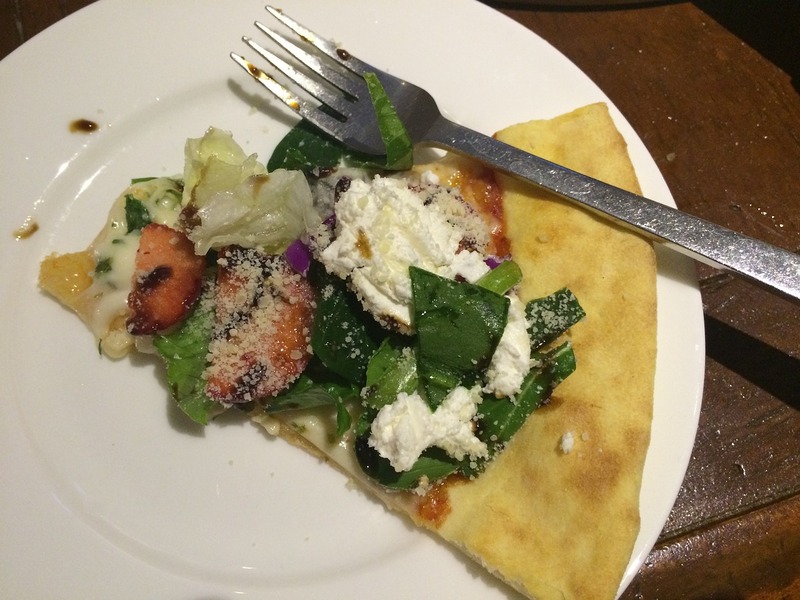 Flatbreads of all sorts became staples for us. These were things I would never have thought to make myself in the States because I could just buy them. These are great even when you don’t have an oven, or your “glorified Easy-Bake” is being used for something else. I won’t post recipes for all of these. Let the Internet do its magic and find you a good recipe for whichever flatbread you’d like to try making. It’s no shocker that yogurt can be made at home. The surprise for me was that you don’t need an “As Seen on TV” yogurt making machine or packaged powder starter to do it. This is such a help in China where all the yogurt is very thin and very sweet. You can control the thickness and sweetness when you make it yourself. The recipe below says to drain off liquid for thicker yogurt, but you can also add milk powder to the milk before stirring in the starter. If you want to shoot straight up to Swankypants Foodie level, tell your friends that you make your own ricotta and paneer cheeses at home. (Well, technically you have to also actually make them, not just tell people you do, but YKWIM.) You lose some points with the Foodies if you use a microwave rather than the stovetop, but I will still be your friend. Pro expat tip: you do not need actual cheesecloth. You can use a tea towel (the flat woven kitchen towel that some people call a dish towel, not the fuzzy, fluffy towel that others call a dish towel. Geez, English, get your act together!!) for the straining part of the process. In the U.S., there’s not much reason to make sour cream at home because it’s just as cheap (cheaper?) to buy it pre-made in tubs. In China, you’re gonna need to DIY. But it’s the easiest thing on this list. Not even gonna post a link because it’s so simple. Mix 1 cup of heavy/whipping cream with 1/4 cup of white vinegar. Let it sit for a few minutes (depends on how hot/humid your kitchen is), then stir. Voila! If you want to use metric measurements or need a different quantity of sour cream, simply use 1:4 ratio of vinegar to cream. I had previously made many different types of homemade salsas but I had never attempted taco sauce/hot sauce. China forced me to step into that final frontier. Don’t laugh, but my favorite recipe was this one based on Taco Bell Mild. Be sure to avoid that one kind of canned tomato paste in China that turns everything it touches hot pink. *shudder* There is absolutely nothing spicy in this recipe, so if you 不怕辣 or 怕不辣, add in some hot pepper (fresh, dried, powdered, whatever) to increase the heat. And can I be totally honest? I rarely followed this recipe correctly because my spice cabinet is very basic in China. Usually I only put in the garlic powder and cumin, and it still tasted close to the real thing. Or at least, waaaaayyyy better than ketchup on tacos. Let’s hear it for lowered expectations! For some of you, the fact that you can make things like the above foods at home is no big revelation. You probably have kombucha on the counter, granola baking in the oven, and a pan of mushrooms growing in compost under your bed. Good on you! But maybe this will be helpful to some of you who have come to adulthood relying on boxed mac & cheese or pre-made burger patties as mealtime staples and are now facing a whole new world. And now I would love to hear your experience! 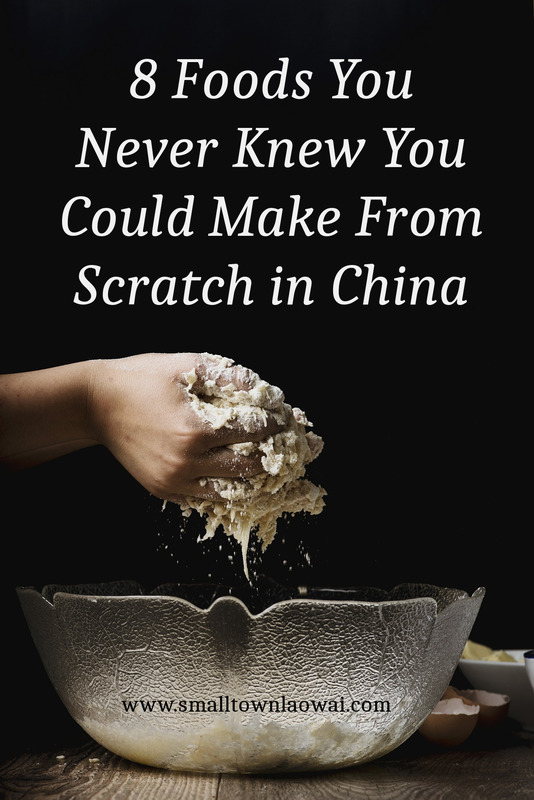 What things have you learned to make from scratch while living overseas? Share in the comments! We’d all benefit from some good ideas for overseas cooking. You’ve made me hungry! LOL I’ve made my own ricotta and could not believe how easy it was. Waaaay cheaper and possibly healthier than the expensive one shipped to the local expat grocer. Yes! Like, why wasn’t I making this myself forever? I still get incredulous stares that I make macaroni and cheese and cakes and pie from scratch. Come on meguo, didn’t you have a grandmother??????!!!!! It’s so easy to buy those things at the store in the U.S. that many don’t even think about making them homemade! But they do taste better homemade. What a great post, Emily! Thank you! I actually cured my own ham when we lived in SE Asia! When we moved back to the States, our son turned up his nose at a ham I bought at the grocery store–it just wasn’t right to him. That is really impressive, Sue! And it must have been tasty if it spoiled your son for “regular” ham. *pesto – basil, garlic and olive oil – YUM! *mustard – I hated the thought of paying 25-30RMB for a small bottle. Mustard seed, vinegar and a pinch of sugar! It is better than US mustard! I know I’ve made more from scratch but these above are the best and easiest!! Thanks for sharing, Emily! You always make me laugh! These are great ideas, Marcia! I don’t think it ever occurred to me to make mustard at home. I will look up a recipe because that sounds very simple. Do you grow your own basil for the pesto? Buttermilk (for baking, not drinking), tortilla chips (bought a 100kuai deep fryer for these babies only! ), chocolate sauce (for chocolate milk, hot chocolate, or ice cream topping), and caramel are some of our staples. Great list! I too, quickly learned I knew NOTHING about cooking upon arrival. Now, when I go back to the US, I’m so confused on what to do…buy pre-made or do what I do and spend 2 hours making dinner?! Nice list, Ashley! I know you are a pro at cooking in China. So, I’m curious: do you use flour or corn tortillas to make your chips? It’s very tempting to go back to store-bought in the U.S. because it is just so bloomin’ easy compared to homemade. “Pro” HA! Girl, I’m just learning as I go, like everyone else! As for the chips–corn tortillas all the way. Here, it’s 25 kuai per bag of tortillas, and it makes a GIANT bucket of them–enough to feed about 15 people on taco night! But, if I was in the States, I sure would just go back to buying them. SO easy! And there are some decent brands there…way better than the cardboard brands here! This list made me smile. I’ve made many things from your list – especially the baked goods. All we eat in Nigeria is white bread. But here refrigeration is my biggest challenge, so it’s often more difficult to find anything remotely dairy (unless it comes in a can). So in addition to some of your list I’ve also tried making cream cheese. It was a bit softer than I was used to, but still worked and tasted great! (And I’m back visiting family in the US and keep using the stove, instead of the microwave, because I’m not used to having the option! My mother just can’t figure it out…) I love how creative expats get when we can’t find an ingredient, and we realize it really isn’t difficult to make whatever it is we were missing! Thanks for the list! Laura, I think you should be proud of yourself because cream cheese sounds like such a feat! Expats can all be proud for our tenacity and creativity when we have to “make do.” And that is funny about forgetting the microwave. I keep subconsciously looking around my U.S. kitchen for my little countertop oven when I am baking or heating things up. Nope. there isn’t one. Thanks so much for sharing your story. Two new from-scratch things I’ve made recently, to use as ingredients in recipes, were cottage cheese and evaporated milk. I had bad memories of my mother’s rubbery homemade cottage cheese when I was a kid, but mine turned out well, and it really was easy! And – I now have an Instant Pot! I had just started seeing lots of comments about it on social media and was wondering just what the big deal was, when a dear older friend contacted me to see if I could use one, and insisted on shipping one to me. I think it’s so funny that I have one here in Uganda, while many of my friends at home are still wishing they had one! Pretty uptown over here! I need to figure out just what I can do with it. Kathy, those are really versatile additions to your repertoire. Yum! It’s funny – we had an electric pressure cooker for years in China before ever hearing the term “Instant Pot.” They are definitely all the rage in the U.S. right now! I always used mine for cooking rice, beans (dried beans that I soaked overnight first), stews, and soups. I would also sometimes use it to make bone broth, which is apparently also a “thing” in the U.S. Who knew I was so trendy?? There are loads of ideas online so I hope you can find lots of useful things to do with yours. Happy cooking! Yes, we expat missionaries are definitely trendy! I had no idea the electric pressure cooker idea had been done in China. I use mine most for beans, but I also made the cottage cheese in it. Think I will try cheesecake soon, after I try making homemade cream cheese. Yeah, they’re very popular in China, though I think they were popular in Korea and Japan first. Cream cheese and cheesecake will be such a treat!